Hydropower is a renewable energy resource because it uses the Earth's water cycle to generate electricity. Water evaporates from the Earth's surface, forms clouds, precipitates back to earth, and flows toward the ocean. The movement of water as it flows downstream creates kinetic energy that can be converted into electricity. 2700 TWH is generated every year. Hydropower supplies at least 50% of electricity production in 66 countries and at least 90% in 24 countries. Out of the total power generation installed capacity in India of 1,76,990 MW (June, 2011), hydro power contributes about 21.5% i.e. 38,106 MW. 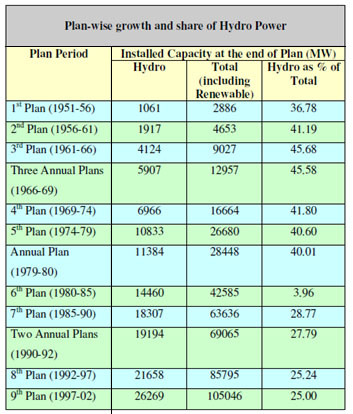 A capacity addition of 78,700 MW is envisaged from different conventional sources during 2007-2012 (the 11th Plan), which includes 15,627 MW from large hydro projects. In addition to this, a capacity addition of 1400 MW was envisaged from small hydro up to 25 MW station capacity. The total hydroelectric power potential in the country is assessed at about 150,000 MW, equivalent to 84,000 MW at 60% load factor. The potential of small hydro power projects is estimated at about 15,000 MW. A hydroelectric power plant consists of a high dam that is built across a large river to create a reservoir, and a station where the process of energy conversion to electricity takes place. The first step in the generation of energy in a hydropower plant is the collection of run-off of seasonal rain and snow in lakes, streams and rivers, during the hydrological cycle. The run-off flows to dams downstream. The water falls through a dam, into the hydropower plant and turns a large wheel called a turbine. The turbine converts the energy of falling water into mechanical energy to drive the generator After this process has taken place electricity is transferred to the communities through transmission lines and the water is released back into the lakes, streams or rivers. This is entirely not harmful, because no pollutants are added to the water while it flows through the hydropower plant. In addition, 56 number of pumped storage projects have also been identified with probable installed capacity of 94 000 MW. In addition to this, hydro-potential from small, mini & micro schemes has been estimated as 6 782 MW from 1 512 sites. Thus, in totality India is endowed with hydro-potential of about 2 50 000 MW. 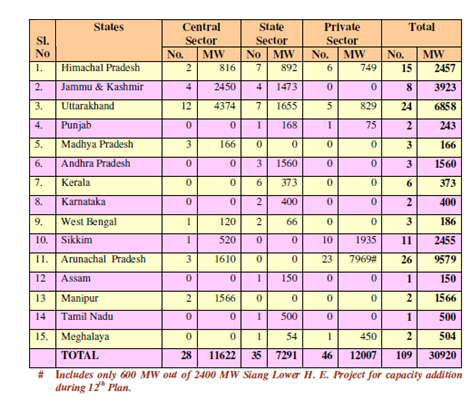 The total installed capacity of India is 36878 MW. In India, hydro power projects with a station capacity of up to 25 megawatt (MW) each fall under the category of small hydro power (SHP). 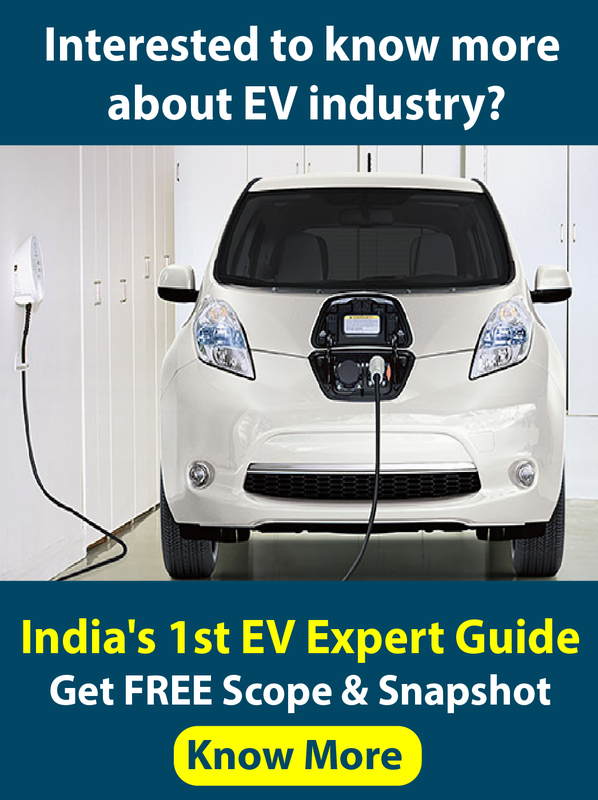 India has an estimated SHP potential of about 15 000 MW. The total installed capacity of small hydro power projects (upto 25 MW) as on 31.03.2009 is 2429.77 MW from 674 projects and 188 projects with aggregate capacity of 483.23 MW are under construction. Diverting a river affects the nature of the countryside and does not lend itself to use on a large scale. Permanent complete or partial blockage of a river for energy conversion is adversely affected by variations in flow. Building large-scale hydro power plants can be polluting and damaging to surrounding ecosystems. Changing the course of waterways can also have a detrimental effect on human communities, agriculture and ecosystems further downstream. Hydro projects can also be unreliable during prolonged droughts and dry seasons when rivers dry up or reduce in volume. Karshni Intertech Pvt.Ltd is a manufacturer, wholesale supplier, exporter of hydro energy products. 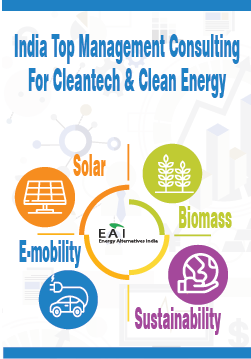 Their range of products include hydro energy system components (small), hydroelectric turbines (small), solar charge controllers, water pumping windmills, wind energy system components (large), backup power systems, 100% renewable energy farming , fully integrated systems. Multitek Consortium is a hydro energy based company located in Delhi, India. Their range of products hydro energy system components (small), water pumps, turbine machines, gates and hoists, penstock etc. Nagalaxmi Industries are manufacturers of industrial structures for thermal, hydel, nuclear power station, food industries, pharmaceutical, chemical, cement etc. SBA Hydro Systems Pvt. Ltd is a manufacturer, wholesale supplier, exporter of hydro energy products. Their range of products include hydro energy system components (small), hydro energy system components (large), hydro energy systems (large), hydro energy systems (small), hydroelectric turbines (small), hydroelectric turbines (large).